The year 2013 marked the 100th anniversary of the 1913 Land Act in South Africa which legalised the violent dispossession and alienation of the African majority from the land. It is common cause that the alienation of land for conservation purposes, introduced to Africa under colonial rule, has continued more or less uninterrupted until today. However, while nature conservation practices inevitably raise challenging questions relating to land and land use, there has thus far been little concentrated effort to bring together scholars working on the land question, particularly around issues of land tenure, with those whose work focuses on questions of nature construction and the social impacts of conservation in an African context. Compiled from research presented at a ground-breaking interdisciplinary conference held at Rhodes University in Grahamstown, South Africa, in 2012, the chapters in this book made their first appearance in a special issue of the Journal of Contemporary African Studies (JCAS) in July 2013. 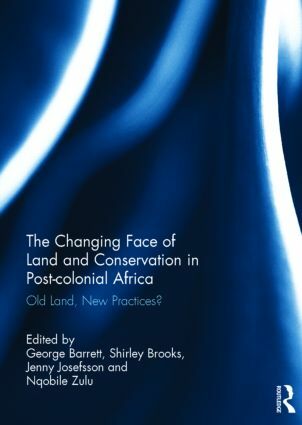 The book brings critical interdisciplinary analyses of the complex interrelations between contemporary (neoliberal) conservation practices in post-colonial Africa, into conversation with the well-trodden territory of land use and contested land issues on the continent. Anchored by an intellectual curiosity about the extent to which past practices continue into the present and with what consequences, the book provides fresh insights into the complex relationship between land and conservation in contemporary Africa. George Barrett works in the field of international relations, security and environmental politics. Her doctorate argues for the reinvigoration of Critical Security Studies in Southern Africa, giving centrality to human-environment relations in rethinking security and emancipation in the region. Her research views these issues through the optic of peace parks. Shirley Brooks is a human geographer and environmental historian. Her research explores social histories of nature conservation and land issues in South Africa. She has written on the history of the Zululand game reserves as well as private wildlife production and related geographies of tourism and hunting in KwaZulu-Natal. Jenny Josefsson’s research explores the relationships between people, land and wildlife on private game farms in KwaZulu-Natal. She has a special interest in the dynamics of ethnographic fieldwork and knowledge-generation. Nqobile Zulu’s research interests span across the spectrum of Agrarian reform, development and the interface it brings to rural communities. His current work focuses on the transition to private game farming and the contestations developing in the Groot Marico district of the North West province in South Africa.